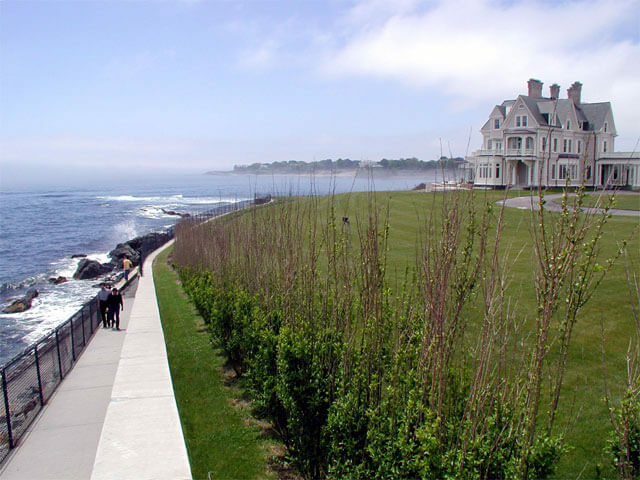 Newport, Rhode Island is a beautiful city, dating back to before the colonies. It was the site of one of the earliest Jewish communities in the Americas with a continued presence until the revolutionary war, when the city was occupied by the British. 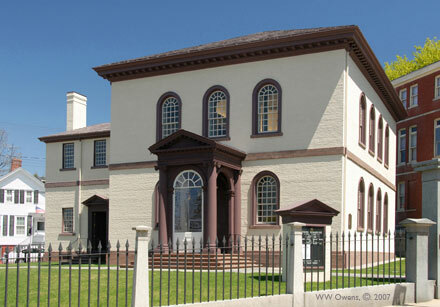 The Jewish community more-or-less disbanded, mostly moving to New York City, but the Touro Synagogue remained, having many uses until it became a national historic landmark, in part because of Washington’s famous letter (probably written by Jefferson) concerning religious freedom in the United States. Today, the Congregation Jeshuat Israel remains in the Touro Synagogue, and you can find a minyan on Shabbos, and in the summers, even on many weekdays from the Jewish tourism. There is even a small eruv which covers the area from the Admiral Weaver Inn to the synagogue. The only regular minyan is town is at the Tuoro synagogue, where an Orthodox Rabbi continues to lead a congregation which consists of local Jews (who are not yet fully Torah observant) who often double as tour guides. On Shabbos, there are lots of Torah observant tourists who make up a proper minyan, and the Rabbi lives across the street from the synagogue. There are no tours or other sorts of schtick on Shabbos in the shul . . . it’s just like an other frum shul. The tours are reserved for other days, when the building becomes a historic site more than a shul. The nearest “full service frum” Jewish community is Providence, quite a drive away. There are numerous small hotels near the Tuoro synagogue. People tend to stay at any number of them. The best way to find them is simply to look at this map of hotels in the area. The Viking Inn seemed to be popular, nearby, and accommodating of frum Shabbos needs, like providing a room to eat, letting you use a blech to keep your food warm, and so forth. Not too far away is a Bed and Breakfast which advertises as “kosher.” This would be the Admiral Weaver Inn where many frum Jews stay when visiting Newport, especially on Shabbos. I would call it, “Shabbos friendliest” of Newport, but don’t expect meals here. The Inn, at the time of this writing, is owned by a Jew but operated by a non-Jew who is hired to run the place. She knows about kosher, about dressing respectfully for the crowd (she dressed tzniously when we stayed there), and is very helpful, but the only kosher food served is a) fruit and the like on Shabbos, and b) a full pancake breakfast on Sunday where the Rabbi comes and lights the fire and oversees that it’s kept kosher. The Inn will offer to get you “catered” meals, but these are shipped in from Providence and, in our case, were exceedingly expensive and not enough to feed anyone. We were left scrambling to a supermarket before Shabbos to find whatever we could to supplement our meager, barely edible rations. You may choose to stay here because it is a Shabbos atmosphere with all or almost all Shomer Shabbos guests and, in my case, great zemiros, but you’ll need to bring your own food. There is a warming oven where you can put your wrapped food to make it warm and some even bring knives and pans and do some real preparation. Newport is a beautiful city. You can walk for miles along the path wrapping around the edge of the cliffs (The “cliff walk”), visit huge mansions from the formerly filthy rich families (before inheritance tax took care of that), rent boats, and just walk around the narrow colonial streets and look around / shop. If you’re coming from New York or New Jersey, on your way back you can stop in Mystic, CT and visit the Mystic Seaport where they turned a formerly decaying seaport into a museum with lots of exhibits showing what it was like when it was active. This includes ship building, metal working, and rope making. You can easily spend half a day or most of your day here. The Admiral Weaver no longer claims to be in any way kosher. I just spoke with them directly on the phone and confirmed this. We spent an afternoon here chol hamoed Succos and it was beautiful. The shul is gorgeous and the city is very quaint (at least in the area just south of the shul). There are quite a few very interesting shops along Thames St. I would love to come back to spend more than just a few hours here.